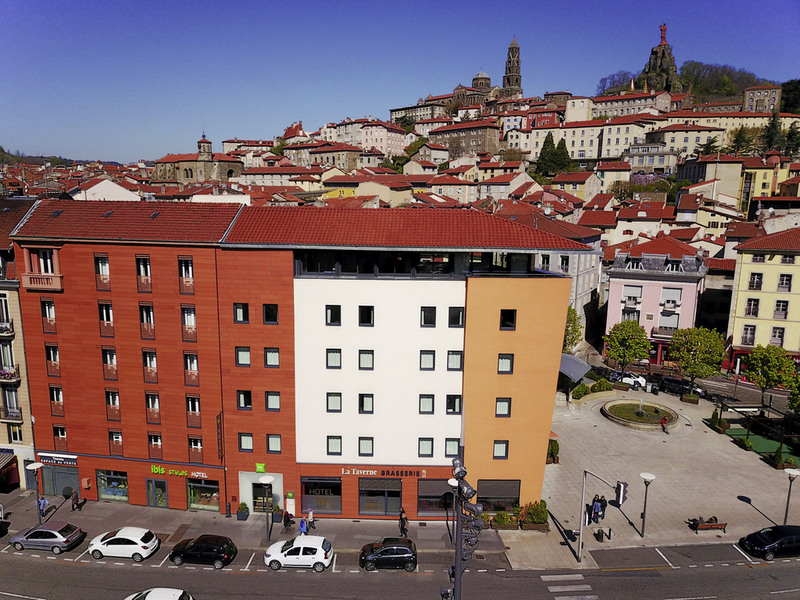 We welcome you to our beautiful city of Puy-en-Velay which will seduce you with its historical centre and numerous tourist and sporting activities. Our team listens to you 24 hours a day to make your stay unforgettable! Breakfast included in all prices! Located in the heart of the city centre (shops, theatre and cinema), close to the historical monuments and the starting point of the Chemin de Santiago de Compostela, 200 m from the SNCF station, 5 min. from the main motorways and 15 min. from the airport. Ideal for a business stay (5 min. from both conference centres) or leisure: many outdoor activities to discover for the small and the large: hiking, canoeing, rafting, etc. The hotel is in the heart of the shopping centre and a few meters from the monuments: Cathedral, Rocher St. Michel and Statue Notre Dame de France. You will enjoy walking through the historic centre with its cobbled streets and colourful facades. The hotel is in the heart of the shopping centre and a few meters from the monuments: Cathedral, Rocher St. Michel and Statue Notre Dame de France. You will enjoy walking through the historic centre with its cobbled streets and colourful facades. Located in the heart of the shopping centre and the Old Town (cathedral, the Dyke d'Aiguilhe Standing Stone, the statue of Notre-Dame de France, etc.). La Taverne restaurant, direct access, open 7 days. Breakfast buffet, (freshly squeezed fruit juice) included. Great location, great staff. Ibis never disappoints. Reception staff were extremely friendly, welcoming, helpful. I was most impressed with their professionalism and courteous manner. Will definitely stay here again if I am in Puy again. Best Ibis Styles I have ever stayed at. Lovely hotel which I found warmer, friendlier and roomier than every other Ibis Styles I have stayed at. Receptionist Romane greeted me with a friendly and genuine smile and had seen to it that all of my requests had been taken care of, in particular a quiet room and a blanket rather than a duvet. Car park was good but not too convenient as there is no direct access from hotel but that will not deter me from coming back. Our experience was excellent in all respects: room, staff, hotel fitout, its position in town. We had a very comfortable stay at this hotel. The room was enormous and nice and quiet, the wifi worked well, and breakfast was very good. Best hotel i have stayed in for noise reduction. No banging doors or hearing your neighbour! Very pleasant and helpul staff. Our experience of staying at the hotel was above expectations. We found the staff helpful and friendly, the room was large and well-equipped, we were at the heart of a city with its Old Town, magnificent cathedral and statue of the virgin within walking distance. This hotel is ideally situated of this historic city and restaurants the only draw back is the parking, under ground parking with hazards (I caught my car on a lower lump of concrete) it also means one has to carry your cases up two flights of stairs. Otherwise we had a great stay with very genial staff. Please add the Sat Nav location to the booking confirmation it would make finding the hotel s lot easier for the French are not very clear with their street name. This hotel is ideally situated for a several day stop over, a little difficult to find being in the middle of the city. The food in Tavern was great. Strongly recommend this hotel but most of all please add the hotel's Sat Nav reference to the booking confirmation or at least on the hotel web pages. Warm welcome on a cold and wet afternoon! Excellent receptionist who gave us full information about facilities, city map and evening light show. Room facilities clean and adequate. Evening meal in Le Taverne was good, basic cuisine. Breakfast very good - fresh juice and fruit salad; good choice of breads and viennoiserie. Helpful staff and a comfortable room made it a good experience. Helpful staff at hotel. Clean room. As a place to stay this hotel ticks most of the boxes. Centrally located, plenty of restaurants and bars in the close proximity. Reception staff were very friendly. The only disappointment was the (included) breakfast. Whilst the nominal range of items is good, it was a Fawlty Towers like experience. Muesli and cereals were available but no milk to go with them. The orange juice machine was regularly replenished with oranges but the waste bin was not emptied so the machine did not work. Great hotel in the town centre but with easy access to major roads. Very friendly and helpful reception staff. Very comfortable bedroom and bathroom. Good beds, linen etc. Great wifi connection. Secure underground parking nearby. Slight drag with no lift connecting to hotel but there is a pull in spot outside the hotel to unload luggage. Dear Traveller, Thank you for your very nice review. We are pleased to read that you've enjoyed our center location and the comfort of our rooms. It is always a pleasure to receive positive feedback. I will share your comments with our team. I am sure that this feedback will serve as an encouragement to all of our staff as we strive to continuously improve the quality of our services. Hope to see you again very soon !